HSU Cycling hosted a time trial, road race and criterium on March 22 and 23 in Loleta and Arcata, Calif. Collegiate cyclists from UC Santa Barbara, UC Santa Cruz, UC Davis, Sacramento State, Cal Berkeley, Stanford and Cal Poly came to Humboldt to participate in the three events over two days. 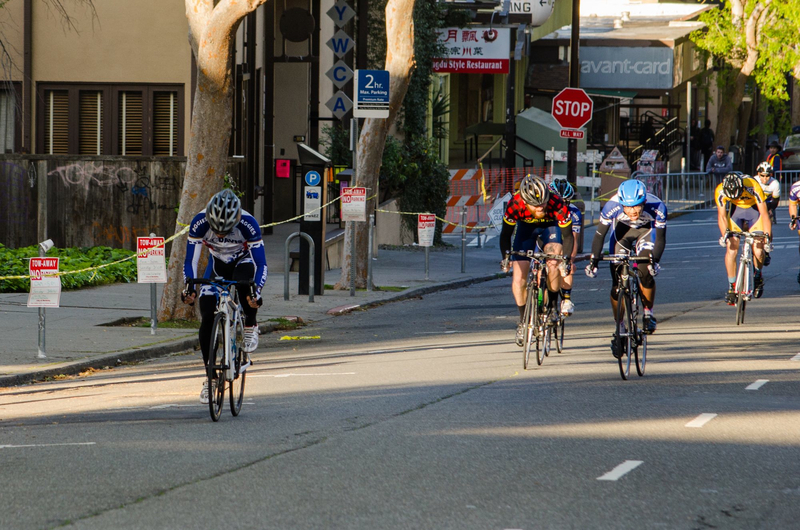 Above: (top) Steven Pearl leads the men’s B field down Harpst Street during the campus crit on March 23. 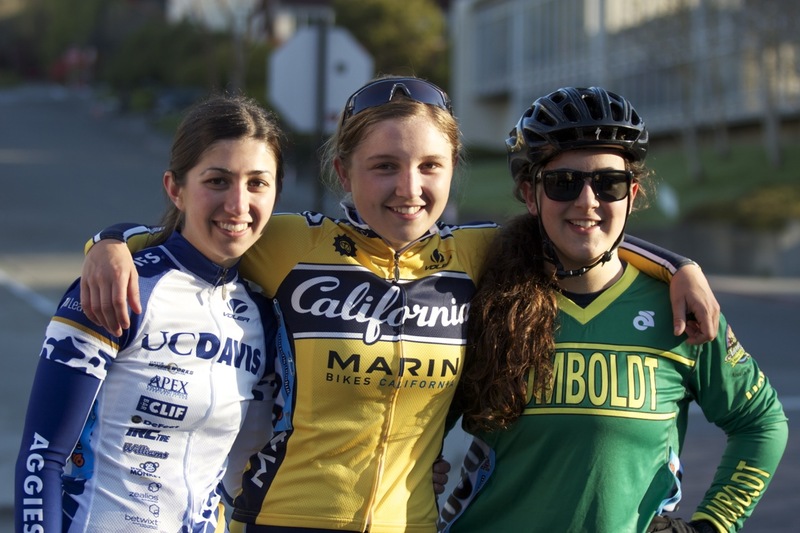 (middle) Cal Berkeley’s Olivia Cope dominated the women’s races, winning the road race and criterium, while HSU’s Sara Schneider got on the crit podium. (bottom photo) Stanford’s Max Silverstein looked strong during the men’s A road race in Loleta on March 22. But UC Davis’ Jon Penaloza won both day’s races. All photos above by Vicky Sama. 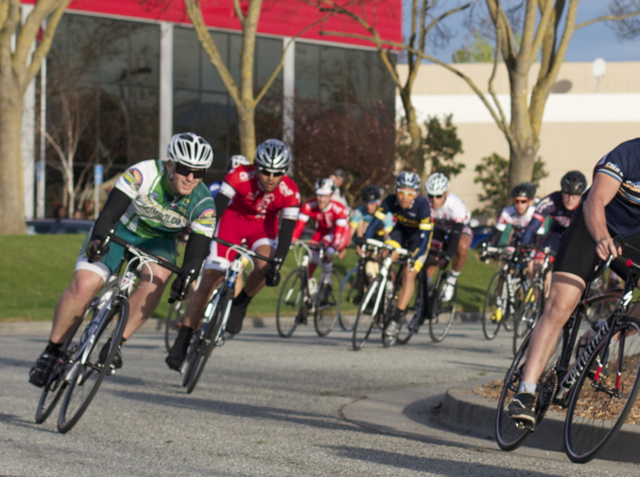 Here’s a nice story on the HSU criterium held on campus on March 23. HSU’s Josh Chapman got 4th place in the Berkeley Downtown Criterium. Here he is going full blast to the line. Photo by Vicky Sama. Humboldt’s Josh Chapman (in the checkered jersey) and Gavin Merczak-Dinolfo charge up the McEwen Hill during the second lap of Saturday’s Crockett Road Race. One Hot Day in the Saddle! Josh Chapman, Gavin Merczak-Dinolfo and Gilbert Marquez started the 20-mile road race at 2:00 p.m., the hottest part of the day. Temperatures soared over 80 degrees as the men’s D category raced the rolling hills of Crockett. As soon as the 35 riders hit the first riser in downtown, the field splintered. Chapman stayed with the leaders, but Merczak-Dinolfo and Marquez were gapped out. When the lead group of nine riders made the sharp right turn up McEwen Hill, a chase group wasn’t far behind. In that chase, Merczak-Dinolfo pedaled forward while other riders faded back. He was riding up on his own, and by mid-climb, he caught the leaders. Chapman was at the back of that lead group, and now Merczak-Dinolfo was on Chapman’s wheel. The ten continued together up the steep climb. The descent was narrow, curvy and bumpy– only one-car-wide– like those high mountain roads in Europe. Chapman and Dinolfo soared downhill but a gap was opening up ahead of them. Still, there was a chance they would regroup on the next more shallow climb past the feed zone. Not so. On the second and final lap, Chapman and Dinolfo were riding alone on Cummings Skyway. Chapman was about 100m behind the lead group of eight riders. Dinolfo was another 100m behind Chapman. Chapman tried to reach the men ahead, knowing that there was one more point to earn if he could finish 9th. But with eight miles left in the race, he slowed down instead to wait for Dinolfo and two other riders– one from Stanford and one from San Francisco State– who were quickly gaining on Dinolfo. The four grouped up to chase down the leaders. Chapman was riding at the front during the descent into Crockett. Then Stanford took a pull and SF State came around on the downtown riser. Dinolfo took his turn at the front while the foursome raced through the curvy rollers toward McEwen. And then they reached the famous hill climb one last time. All four were together at the base of the climb. The Stanford rider slipped to the back. “Put the hurt on them before they put it on you!” coach Vicky Sama shouted from the side of the road. Chapman and Dinolfo pushed the pace. The Stanford rider’s head dropped and shoulders collapsed. He couldn’t hold on. But the SF rider was still there. Now the three riders– including two from Humboldt– were out of the saddle trying to make any gains they could. The three men stuck together on the narrow descent. This part of the race was going to come down to a sprint. Chapman lead through the final turn. They were less than a mile from the finish line where the road starts to rise again. Chapman was still at the front with Dinolfo on his wheel and the SF rider at the back. It appeared that Chapman might tow them to the line and sacrifice for a sprint between Dinolfo and SF. All of a sudden, SF attacked. But it was too soon. Chapman and Dinolfo grabbed his wheel. They countered with a big push, strong enough to pass a Cal Berkeley rider who fell off the back of the lead group. Chapman and Dinolfo stomped on the pedals out of the saddle to finish 7th and 8th. HSU teammate Marquez finished 24th. 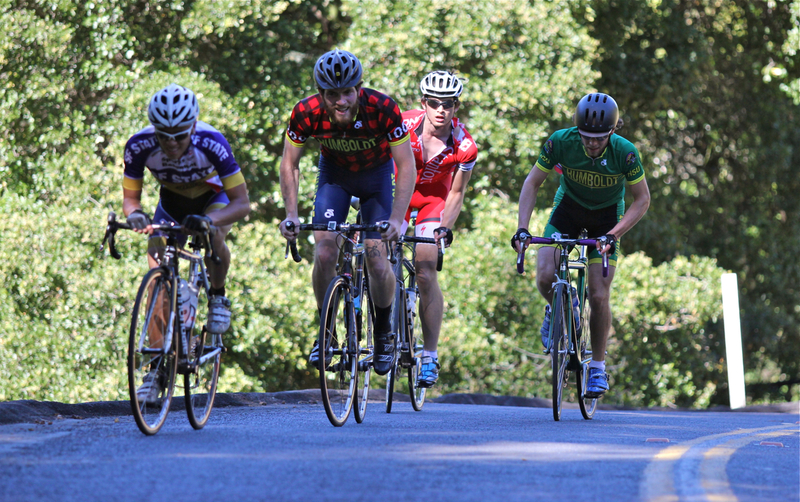 Chapman and Dinolfo sprint past Cal Berkeley to finish 7th and 8th place in the Crockett Road Race. In the men’s C category, Zachary Thompson and Ryan Wiegman raced three laps (30 miles) earlier on Saturday morning. Both fought hard up the McEwen Hill, finishing in the top 25 of the pack. Episode 9 of the HSU Cycling Chronicles takes us to the Stanford road races and criteriums in Paicines and Morgan Hill, Calif. These are surely some of our favorite races on the collegiate race calendar. HSU’s team of Zach Thompson, Josh Chapman, Gilbert Marquez, Gavin Merczak-Dinolfo and Ryan Wiegman raced their hearts out in the men’s C and D fields. Chapman performed a textbook sprint at the end of the men’s D road race for 2nd place– the highlight of the weekend results. Watch the video and see how it was done. Gilbert Marquez, Gavin Merczak-Dinolfo, Josh Chapman and Ryan Wiegman after their 36-mile road race in Paicines on Saturday. Photo by Vicky Sama. In his first-ever collegiate road race, Josh Chapman sprinted from a 17-man breakaway to 2nd place in the men’s D road race on Saturday, throwing his bike forward at the line and missing first place by only a half a wheel length. Chapman and the lead pack averaged more than 19 miles-per-hour in the two-hour race over challenging hills that broke the 50-man field apart. Teammates Gavin Merczak-Dinolfo and Gilbert Marquez finished the day in 33rd and 47th. Ryan Wiegman upgraded to the men’s C category and rallied to finish 35th. 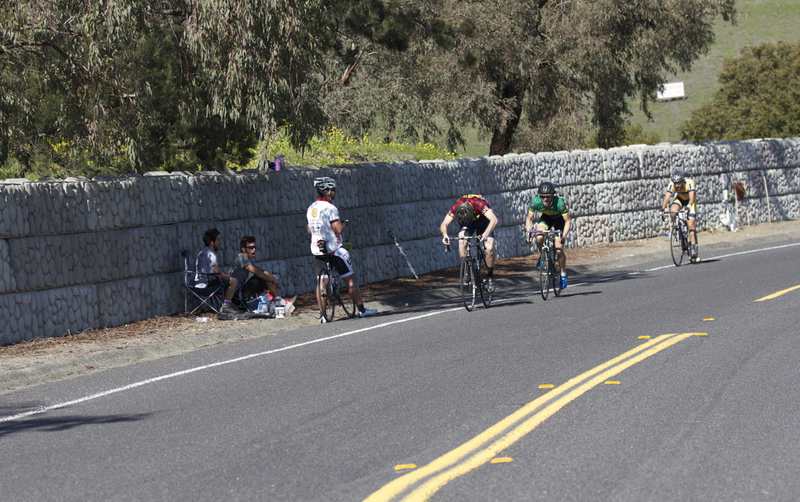 On Sunday, Zachary Thompson joined the foursome for the criterium at the Specialized headquarters in Morgan Hill. Thompson and Wiegman looked strong in the men’s C race, but a series of crashes took its toll. Wiegman survived a late-race wreck that sent four riders to the hospital. Officials temporarily stopped the crit to allow emergency responders to scoop up the injured. After about an hour, the race restarted with the remaining riders getting five laps, and Wiegman, with his left knee bleeding, finished in the top 20. 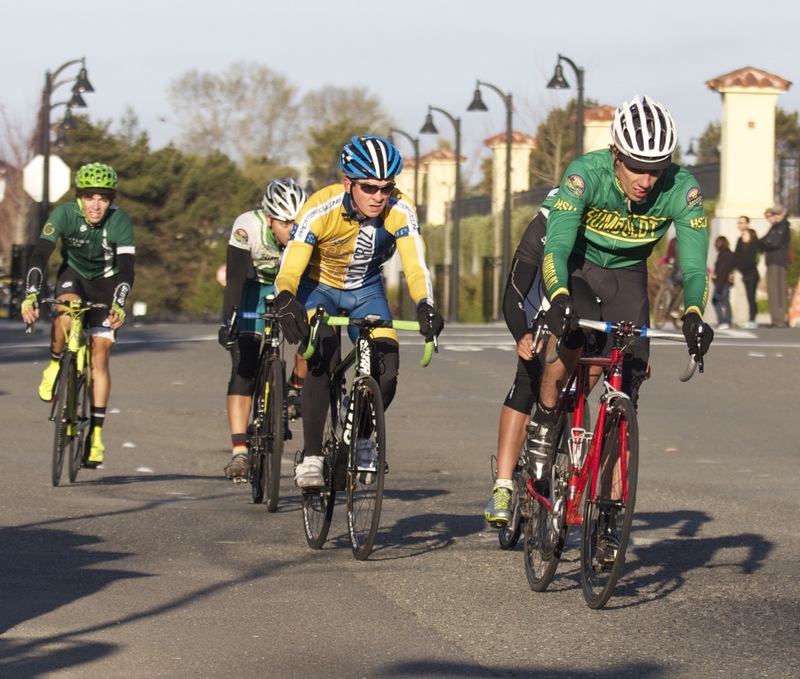 Gilbert Marquez pushes the pace at the front of Sunday’s criterium in Morgan Hill. In the men’s D crit, Gilbert Marquez had one of his best races yet, pushing a hard pace at the front of the pack and causing the field to break apart. Those who couldn’t stay in contact were pulled. Marquez, Chapman and Merczak-Dinolfo raced well. Chapman had the highest finish among them, in 12th place. 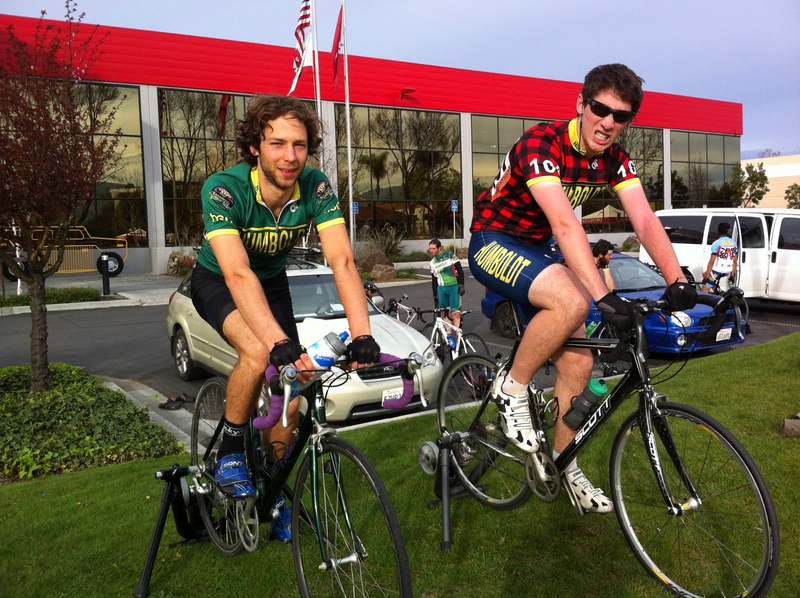 Merczak-Dinolfo and Wiegman riding trainers in front of the Specialized Bicycle headquarters on Sunday. Thompson (l) helps Marquez (r) with a rear wheel mishap. 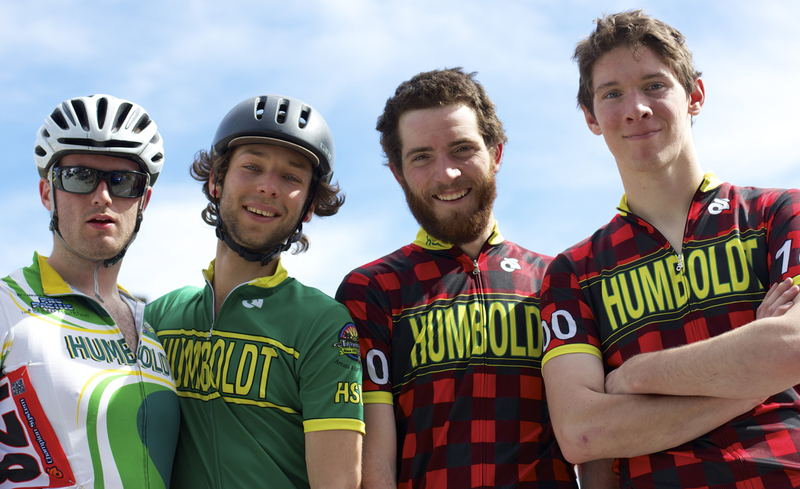 See more race photos at Humboldt State Cycling on Facebook. Mark your calendars! 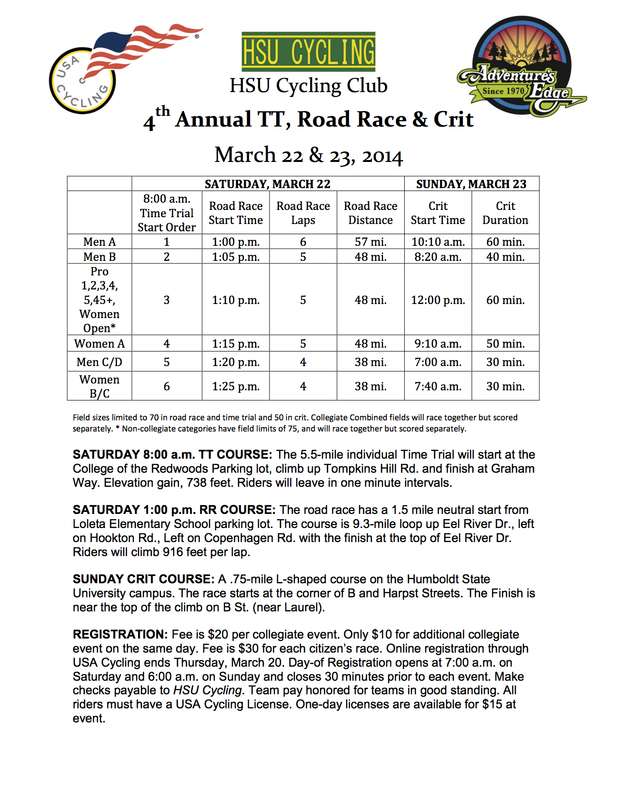 The HSU Road Race Weekend is coming soon with races for collegiate and citizen riders. Enjoy the Redwood forests with some of the fastest cyclists on the North Coast. 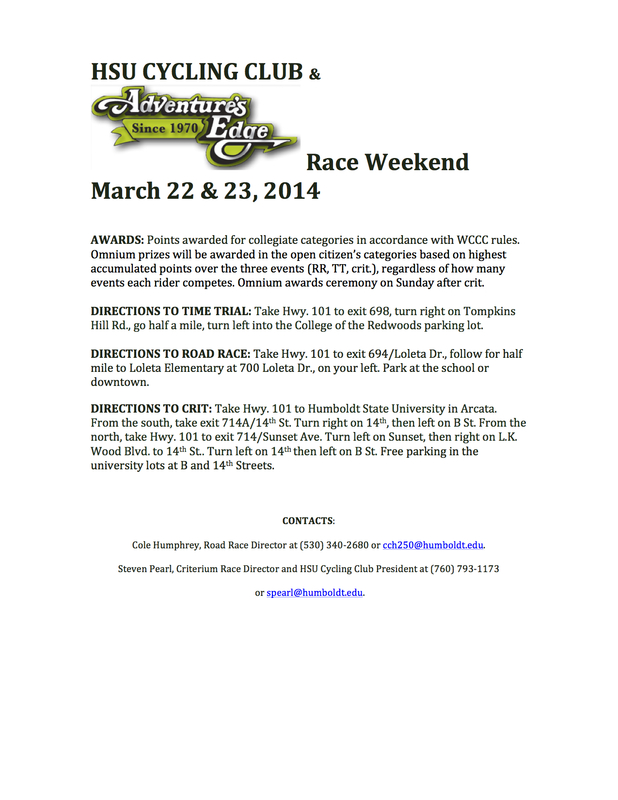 For more details click on the “Our Road Race” tab on the above menu.